SLAVYANSK, Ukraine -- Heavy fighting is taking place in and around the rebel-held city of Slavyansk in eastern Ukraine, Ukrainian and Russian media report. 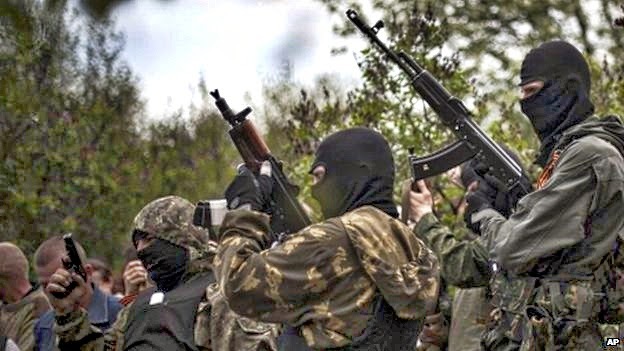 Slavyansk is known to be a stronghold of pro-Russian militants. Ukrainian troops shelled the city in the morning, Russia's Itar-Tass said, with warplanes flying overhead. One member of the security services was reported by local media to have been killed and 13 injured when separatists attacked posts near Slavyansk. The interior ministry said separatist roadblocks had been destroyed. For weeks, eastern Ukraine has been the scene of deadly clashes between government troops and pro-Russian insurgents who have taken over key buildings across the region. On Tuesday, Ukrainian Interior Minister Arsen Avakov urged residents of Slavyansk and also nearby Kramatorsk and Krasnyi Lyman to stay indoors while the "the active phase" against pro-Russian militants was in progress. He said on his Facebook page that separatist checkpoints near Semenivka had been destroyed. Separatists in the area claimed to have destroyed a Ukrainian warplane, a helicopter and several tanks - but these claims could not be independently confirmed. Itar-Tass said there had also been fierce clashes throughout Monday night in Kramatorsk, about 10km (6 miles) from Slavyansk. It said explosions and artillery fire were heard at the local airfield and three separatists were killed elsewhere in the area. On Monday, hundreds of separatists assaulted a border command centre near the city of Luhansk, which remains surrounded by the gunmen. Five militants were reported to have been killed and eight wounded when the centre came under sustained attack. Seven border guards were said to have been wounded. As many as 500 pro-Russian gunmen are believed to have been involved in the assault. Correspondents say the separatists have become more and more aggressive in their assaults on government-held positions as they try to obtain weapons and ammunition from Ukrainian forces. Ukrainian President-elect Petro Poroshenko has said that his priority is to bring fighting in the east of the country to an end.